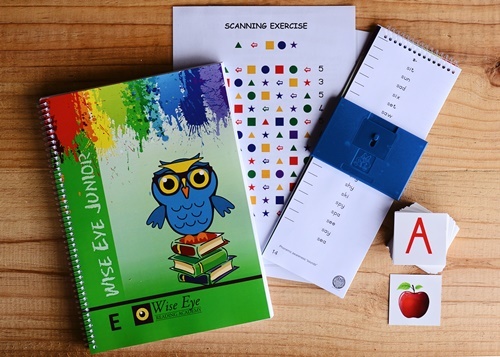 The Wise Eye Learn to read Junior set is aimed at Grade R and Grade 1 readers. The purpose of the programme is to introduce reading to Grade R in a playful manner and to establish a fluent reading rhythm in Grade 1 readers with comprehension. Scanning card (Better eye muscle movement necessary for reading). Manual with stories and activities (Learn and practise sounds auditory and visually for Grade R; and improve reading fluency, reading speed and comprehension in Grade 1). Letter-cards (Establish sounds and building words). Flash words and numbers book with the blue flash-machine (Establish sounds, extends vocabulary, improves spelling, improve short-term memory and broaden the width of their eye span).